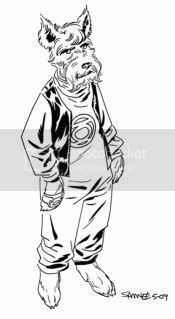 I'll have stories in the upcoming Blackest Night: Tales of the Corps #1 and #3 so obviously Green Lanterns have been on my mind a lot lately. So what better time than now to have a Green Lantern week, right?! So without further ado here's another character along the lines of last week's Ch'p that most folks either love or hate, G'nort! that is awesome, like really awesome! Thanks for featuring a GL week, Chris! You've made Brian's and my day! I just finished re-reading the Giffen and DeMatteis run on Justice League, so as you can imagine, your selection of G'Nort to start things off is right up my alley. I love how you've played up his Terrier facial features. Brilliant representaton, sir! G'Nort is so loveable! The DCU wouldn't be the same without him! Fantastic job! Awesome theme and I like your take on G'nort. Since Matt brought up that great JL run how about Guy Gardner? His show down with Batman and Blue Beatle's reaction to is a great moment in comic history.